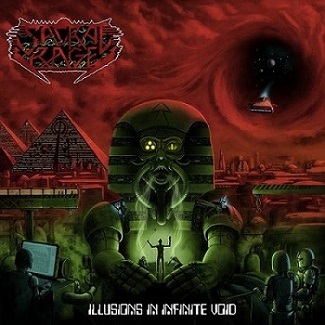 Sacral Rage play heavy metal of many, many parts, all grounded in 80s acts like Iron Maiden, Judas Priest, Mekong Delta, Megadeth, ADX, Toxik, Crimson Glory, and Voivod. That may read like a pedant’s list of references, but it is accurate all the same; Sacral Rage are dexterous at their instruments and admirable students of the genre, but the amount of content they cram into their songs makes Illusions In Infinite Void an exhausting experience on first acquaintance. Patterns changing on the fly make navigation especially difficult but with persistent listening and no small tolerance for Geddy Lee-like vocals comes a greater appreciation for buried hooks and the band’s tribute-paying style of composition. What does originality mean in the context of traditional heavy metal anyway? Is it even possible at this late date to be an original heavy metal band? I don’t believe telling a good story and singing a good song ever goes out of fashion or runs out of inspiration, provided that which makes the core of a good story and a good song remains beyond reproach. The building blocks never change; they are after all what unites us as one species and enable us to share common experiences and emotions. Originality lies at the culmination of that process, as something unmistakably different from what has gone previously. Originality has a way of remaining entrenched in the mind, for memorability is the ultimate means through which the truly original lingers on and distinguishes itself from the rest. To me, originality, then, is memorability, at least in this context. I realize that this reasoning is open to being faulted for subjective bias, but this kind of originality – and the memorability on which is it grounded – appeals repeatedly to the higher natures of our intellect, and so is different from the cheap, duplicitous memorability of the pop song. As listeners hopefully more in tune with quality, as it applies to music and to ourselves as human beings, than the average pop listener (arrogant, yes, but this is true once we brush aside social proprieties), we are in a better position to decide what those higher natures of the intellect are. Memorability is naturally a function of time; so, arguments pertaining to Sacral Rage‘s originality, when viewed from this angle, will necessarily have to be made after some time. For now, it is enough that we have a young heavy metal band making music in honorable tradition. This entry was posted in Heavy Metal and tagged Greece, heavy metal, Illusions In Infinite Void, Sacral Rage. Bookmark the permalink. Top album. I’d love to hear what you think of Borrowed Time.